(Nanowerk News) Berkeley Lab’s National Center for Electron Microscopy (NCEM) provided the technology and a Visiting Scientist Fellowship that helped a Missouri State University researcher make a key discovery which should boost efforts to use carbon nanotubes as catalytic supports in direct ethanol fuel cells. Using the advanced characterization capabilities of NCEM’s TEAM 0.5 and Tecnai microscopes, materials scientist Lifeng Dong found that single-stranded DNA can be used to disperse bundles of single-walled carbon nanotubes into individual tubes. The single strands of DNA can also serve as guideposts for synthesizing platinum nanoparticles onto these tubes. 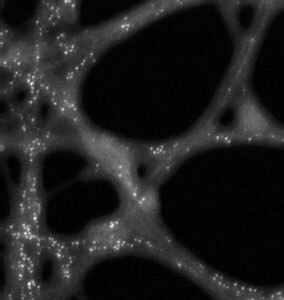 This STEM image, obtained using NCEM’s Tecnai at a resolution of 0.14 nanometers, shows the platinum particles (white dots) and their locations on carbon nanotubes and DNA strands. The Tecnai's nano-analytical capability was also used to determine the compositions of the nano-particles in the sample. “Without the Visiting Scientist Fellowship from NCEM, I would not have had the opportunity to work with NCEM scientists and to use state-of-the-art microscopes to characterize those samples,” Dong wrote in a letter to NCEM director Uli Dahmen. Dong acquired his images at TEAM 0.5 and the 200 kV Tecnai with the help of Berkeley Lab staff at NCEM including Christian Kisielowski, Thomas Duden, Masashi Watanabe, Zonghoon Lee and ChengYu Song. Portable fuel cells powered directly by ethanol have the potential to be far more efficient than ethanol-powered combustion engines and far more practical than hydrogen fuels cells, as ethanol is easier to store and transport than hydrogen. What’s been missing for the production of direct ethanol fuel cells is a good catalyst for oxidizing ethanol. Platinum-coated single-walled carbon nanotubes (SWCNTs) show bright promise for this task because of their high electronic conductivity and surface area. However, it is the nature of these single-walled nanotubes to form bundles. For them to be effectively used as supporters of platinum catalysts in direct ethanol fuel cells, efficient ways must be found to separate bundled SWCNTs into individual tubes and to synthesize platinum nanoparticles on the nanotubes. 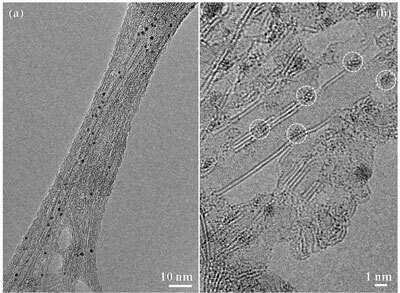 The TEM image in (a) shows platinum nanoparticles (black specks) on a bundle of single-walled carbon nanotubes. Under higher magnification in (b), the nanotubes start to separate from one another and the configuration of the platinum particles (dashed circles) along the nanotubes is revealed. The acronym TEAM stands for Transmission Electron Aberration-corrected Microscope. TEAM 0.5 is capable of producing images with a resolution of one-half angstrom, which is less than the diameter of a single hydrogen atom. TEAM 0.5 also has the ability to correct for the image-degrading phenomenon known as spherical aberration. The 200kV Tecnai microscope is optimized for materials research that requires either the highest resolution scanning transmission electron microscopy performance, meaning imaging and spectroscopy, or correlated imaging and analytical methods. NCEM is a U.S. Department of Energy national user facility that is hosted at Berkeley Lab. Established in 1983, it is one of the world’s foremost centers for electron microscopy and microcharacterization.